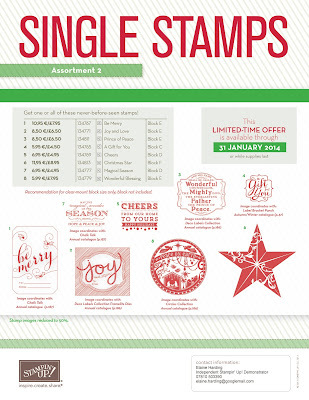 SINGLE STAMPS -- NEW CHRISTMAS COLLECTION! A new, Christmas-themed collection of single stamps is now available! The festive season will be here before you know it, and these Christmas-themed single stamps may be just what the budget-conscious stamper needs. There are eight different stamps to choose from, six of which coordinate with Framelits dies or punches. These stamps are only available until 31 January, 2014. These stamps are available on any order type—customer, demonstrator, workshop, or online. These Christmas-themed stamps are only available through 31 January, 2014, so get them while you can! You can see the images more clearly below - they are not in sequence. You can contact me via email - elaine.harding@googlemail.com or better still, just click on the "Shop Online" button at the top right of my blog to take you directly to my Stampin'Up! web page, create an account with me, if you haven't already, and ensure my name appears in the top right corner. Remember to key in September's Mystery Hostess Code before you check out!